This chapter shows how Theodore Sorensen became an indispensable member of Senator Kennedy’s team as the 1960 presidential election approached. 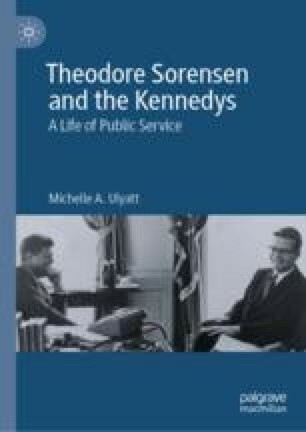 It examines the role Sorensen played in shaping the strategy and themes for Kennedy’s campaign, and how he focused the Senator’s rhetoric on the themes of public service and national change. The chapter explores how the Kennedy campaign sought to counter the appeal of its opponent, Richard M. Nixon. Further, it examines the relationships between the key figures on the Kennedy team and details the extent of their responsibilities. Ulyatt argues that Theodore Sorensen, Robert F. Kenned y and Stephen E. Smith were the three men who were crucial to Kennedy’s success in the 1960 presidential election. Kennedy, John F. 1960. “Address of Senator John F. Kennedy to the Greater Houston Ministerial Association.” John F. Kennedy Presidential Library and Museum, September 12, 1960. https://www.jfklibrary.org/Asset-Viewer/ALL6YEBJMEKYGMCntnSCvg.aspx. ———. 1960. “Address of Senator John F. Kennedy Accepting the Democratic Party Nomination for the Presidency of the United States, Los Angeles, CA.” John F. Kennedy Presidential Library and Museum, July 15, 1960. https://www.jfklibrary.org/Research/Research-Aids/JFK-Speeches/Democratic-Party-Nomination_19600715.aspx. ———. 1960. “The Catholic Issue in American Politics.” John F. Kennedy Presidential Library and Museum, February 1960. https://www.jfklibrary.org/Asset-Viewer/Archives/JFKCAMP1960-1033-012.aspx.